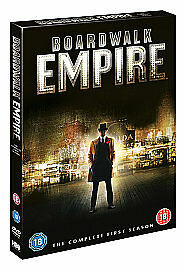 Political boss Enoch 'Nucky' Thompson (Steve Buscemi) runs Atlantic City at the dawn of Prohibition in this drama inspired by Nelson Johnson's non-fiction book Boardwalk Empire: The Birth, High Times, and Corruption of Atlantic City. Follow the life of Thompson, a political fixer and backroom dealer who makes his living from numerous questionable activities including rum-running. Working with the town's sheriff and his brother, Thompson carves a name for himself in the underworld. However, things start to take a turn for the worse when a former associate of Thompson's returns and wants to get his hands in on the business. Sopranos it ain't.......but never meant to be. Not as good as the wire (what is) but better than most. Gripping and captures the 20s with great sets and mix of real and fictional characters. A FANTASTIC BUY and GREAT VALUE!!!!!!! Bought this as we were teased with the first two episodes on virgin media,they were so entertaining & original it left us wanting to see more but sky atlantic is not available to virgin customers. So we had to wait for the dvd release of the series which is so brilliant!!! It's left us wanting more from the second series,but when it will be released we dont know!!! We will just have to be patient! A FANTASTIC BUY and GREAT VALUE!!!!!!! Great series, and great value.